The Dark Horse – Entertainment Ave! Sometimes all you need to find is that purpose in life to overcome your personal challenges. Genesis Potini did just that. “The Dark Horse” tells that story. 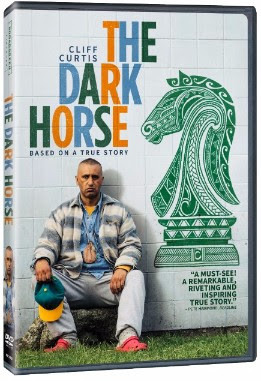 Based on the true story, “The Dark Horse” weaves the history of Genesis Potini (in the movie played wonderfully by Cliff Curtis), a chess champion in New Zealand battling with mental illness who discovers his passion in teaching others the glory of chess, and in doing so is able to calm many of the demons in his head. As the story goes Genesis is out of another mental institution and in the care of his brother, Ariki (Wayne Hapi), a gang leader and a bundle of trouble. Seeing an opportunity to spend his days at a local chess club, the Eastern Knights, Genesis volunteers to help teach the kids, most of whom are disadvantaged children. The leader of the chess club is wary, but gives Genesis the chance, and Genesis quickly proclaims they should enter the National Chess Championships. Genesis begins teaching the children, but there is a secondary problem for Genesis in that he sees that his nephew, Mana, has a natural flair for chess, but Mana is being groomed for inclusions in dad’s gang. Ariki isn’t happy about Genesis pulling Mana away, and the struggles come to a head between brother and brother. Choices must be made, conflicts will happen, but a chess championship must be attended, with the rag-tag group of kids who most would say don’t belong there, holding their own. Genesis, meanwhile, works through his episodes, protects Mana, and sees hope. “The Dark Horse” is a wonderful movie about inspiration, hope, and the ability to overcome personal challenges by helping others. Cliff Curtis is fantastic in his portrayal of a man with demons that can easily take over his life yet can be filled with so much joy when he is doing his calling in life, and on top of Cliff, the rest of the cast, from the children to Wayne Hapi as Ariki, add to the greatness of the film. A joy to watch and be inspired, the “The Dark Horse” can be harsh, rated R for language and drug use, and you could say they should have toned it down, but reality is what it is, and many times “The Dark Horse” didn’t hold back, which is a testament to the filmmakers keeping the honesty and real-life feel for the film. At the end of it all I loved “The Dark Horse.” Great acting and a great story, wonderfully told and portrayed. It’s 4 1/2 stars out of 5.